A cinema is not only a cinema. Ideally, it is a place where conversations, dreams and visuals are woven together, where lovebirds go on dates, old and new friends discuss current topics and cinephiles treat themselves to a movie only they want to see. 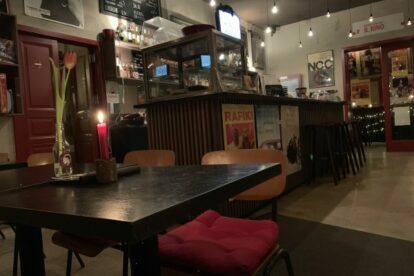 For me, Il Kino is one of these magic places where all of this can happen: Their Italian bistro and bar offers comfort food like panini and tiramisu and lets you take your glass of wine inside the movie theater, which is modern yet cozy with brickstone walls and dark blue velvet chairs. Every so often they sell their movie posters for cheap and each first Wednesday of the month there is a surprise movie, curated by their staff. In short: if you’d like to be in good company, this art house movie theater will give you a warm welcome.